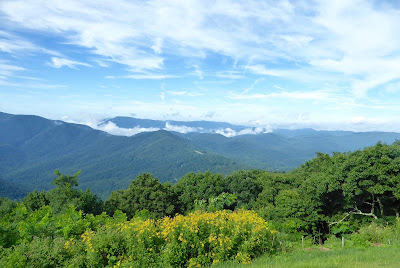 Overlook at Devils Knob loop. 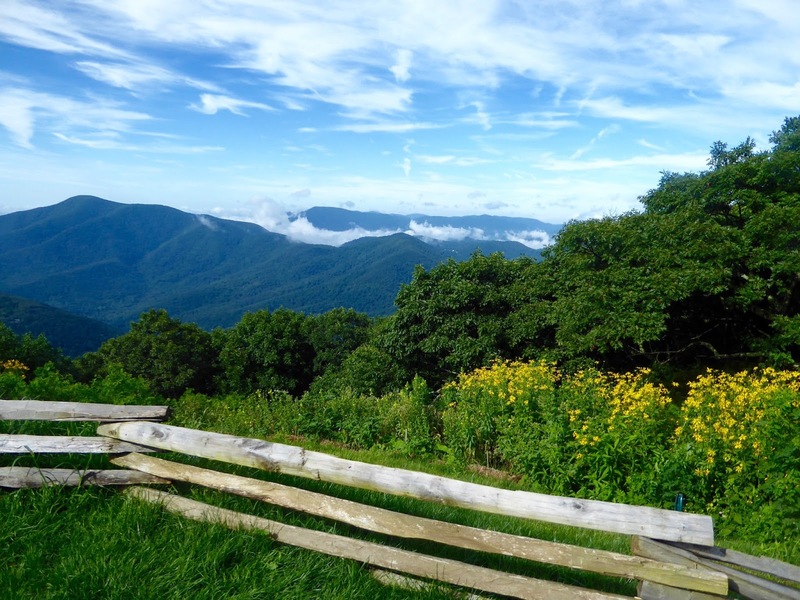 Wintergreen Resort is known by most as Virginia's largest ski area. Snuggled into the peaks, slopes and valley of Devils Knob and Black Rock Mountains, it is within three hours' drive of the D.C. area, two of Richmond and one of Charlottesville. Skiers know it for the 24 ski runs, snowboard and tubing facilities, children's programs and ever-present snow. Looking at ski runs is more comfortable in summer. 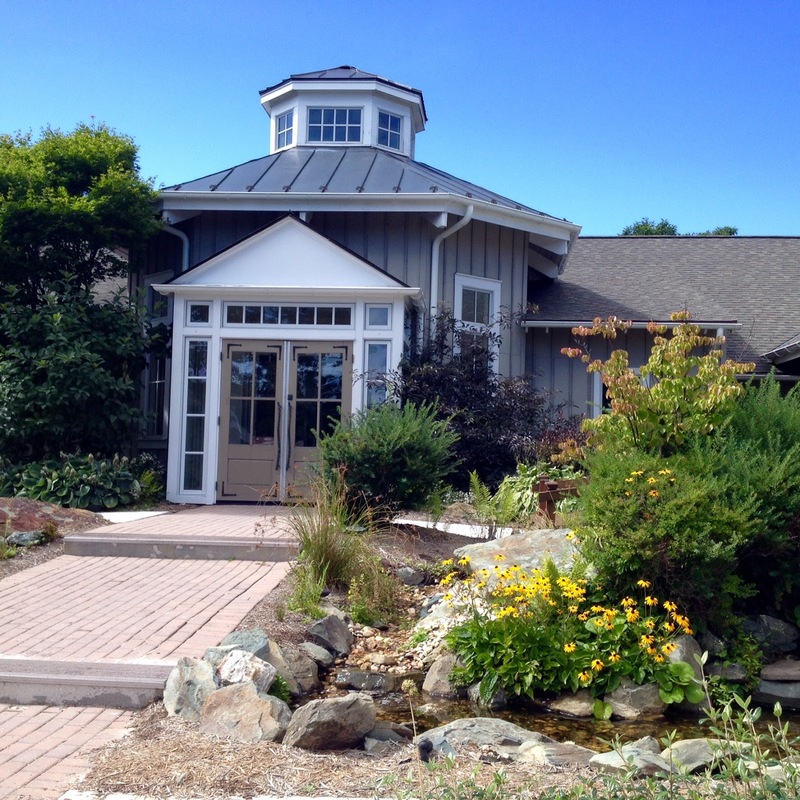 In summer its charms include 30 miles of marked hiking trails, challenging golf courses, an excellent tennis and aquatic facility and a well-staffed spa to ease over-stressed muscles. Several good restaurants, too. 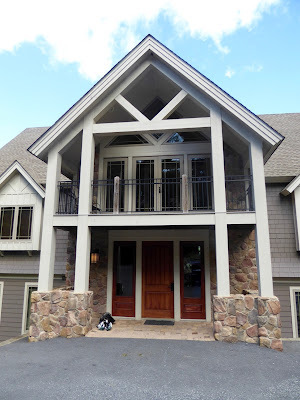 All Wintergreen accommodations are private and range from efficiency suites condos to where I and a group of travel and golf writers stayed, Blue Ridge Retreat, a nine-bedroom, nine and one-half-bathroom house with more than the comforts of home. Two dishwashers and a commercial gas range for example. 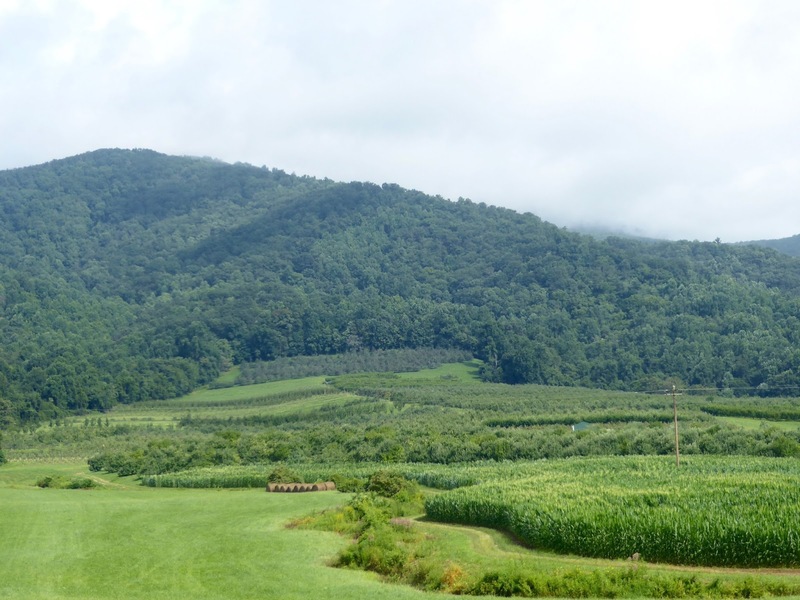 While the golf writers tackled Stoney Creek, the 27-holes of Reese Jones' valley courses, and Devils Knob, the soaring track designed by Ellis and Dan Maples, several of us chose to explore other attractions to be found in Nelson County. King George II granted this land to James Dickie. The Dickie orchard ranged across the valley slopes below Little de Priest Mountain before there was an America. The original James Dickie, a sea captain, received land grants from King George in 1752, 1756 and 1780; the sheepskin and parchment deeds and the land have been in the same family every since. John Bruguiere (his mother was a Dickie) brought us up to date and into the complexities of apple growing. As apple varieties have increased - there are more than 7,000 - trees have shrunk while the apples they produce have grown in size and quantity. 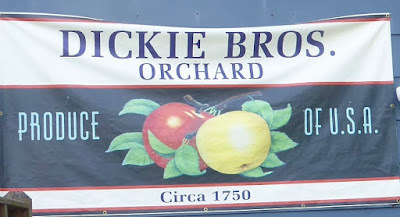 Dickie Brothers Orchard grows 20 different apple varieties along with peaches, pears, nectarines, plums, blackberries, sweet potatoes, pumpkins and squash on 100 acres. One-third of the apple crop, including Gala, HoneyCrisp and McIntosh, all ripen in August. 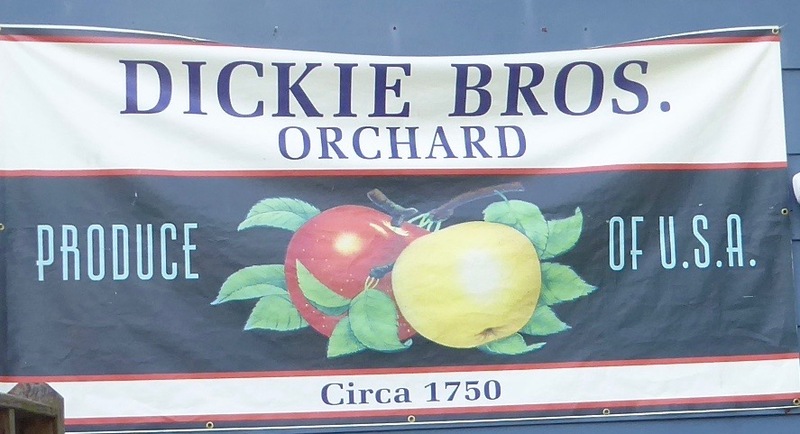 In a county of 15,000 residents one-half million bushels of apples are grown each year; 70,000 bushels from the Dickie Orchard. Turn here and you will find it. 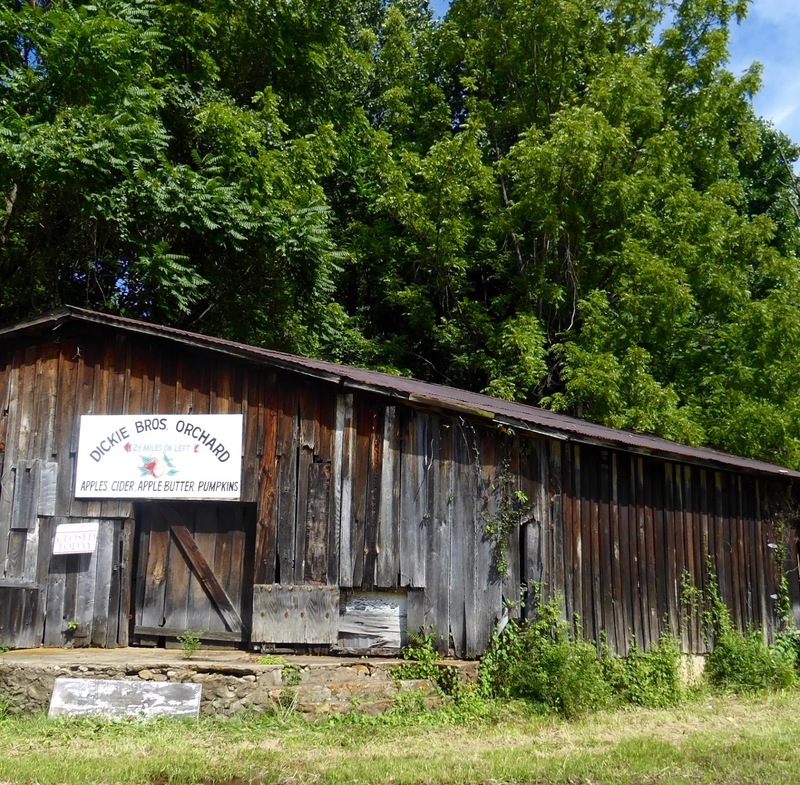 You won't find Dickie Brothers on a main road, but any Newton County resident can give you directions. Handsome sitting area in Nellysford Cider Barn. Appropriately, we headed next to where some of John's apples go, the Nellysford Barn of Bold Rock Cidery in Rockfish Valley. Started in 2012 by founding partners Virginian John Washburn and New Zealander Brian Shanks, the company's success is in large part due to Shanks' internationally acknowledged skills at producing cider. Using locally produced apples he has developed a surprising variety of drinkable flavors. 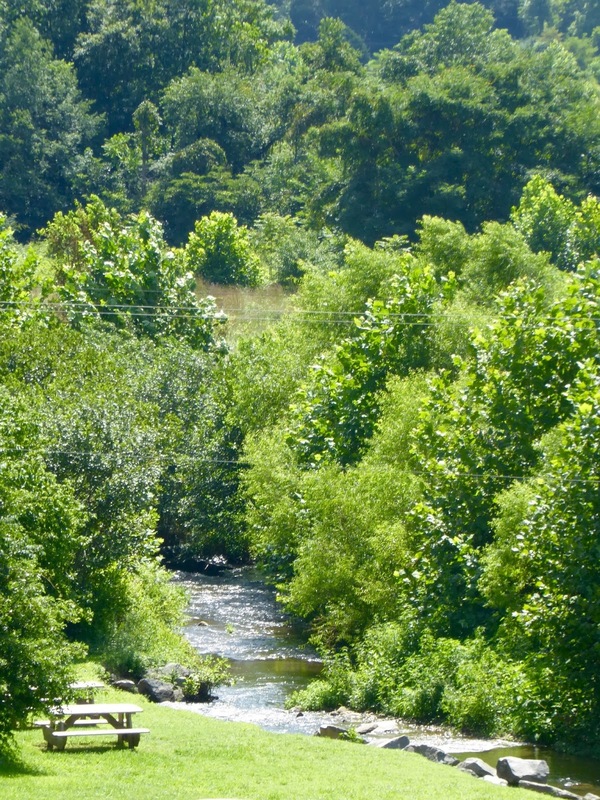 Looking down at Rockfish Creek. 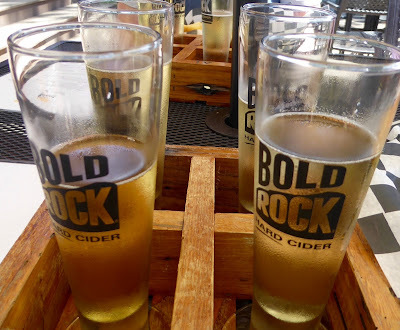 We thoroughly enjoyed learning the history of cider in the small upstairs museum and lunch of sandwiches on the deck overlooking Rockfish Creek, but best of all was sipping our way through a tasting flight of ciders. Overlooking the vines at Veritas. Veritas Vineyard and Winery was our next stop and the handsome building in a bucolic area of rolling hills covered with rows of grape vines did not disappoint. 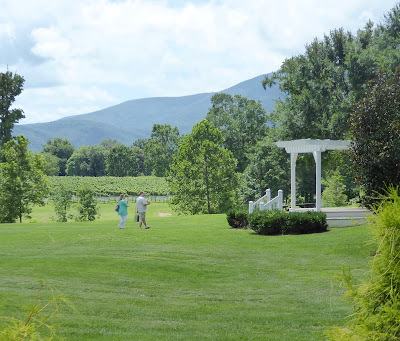 Of course Virginia had a head start in the wine biz with George Washington, Thomas Jefferson and other founding fathers trying their hands with producing wine just as they did with cider. This family operation has gone for quality over quantity and it tastes it. 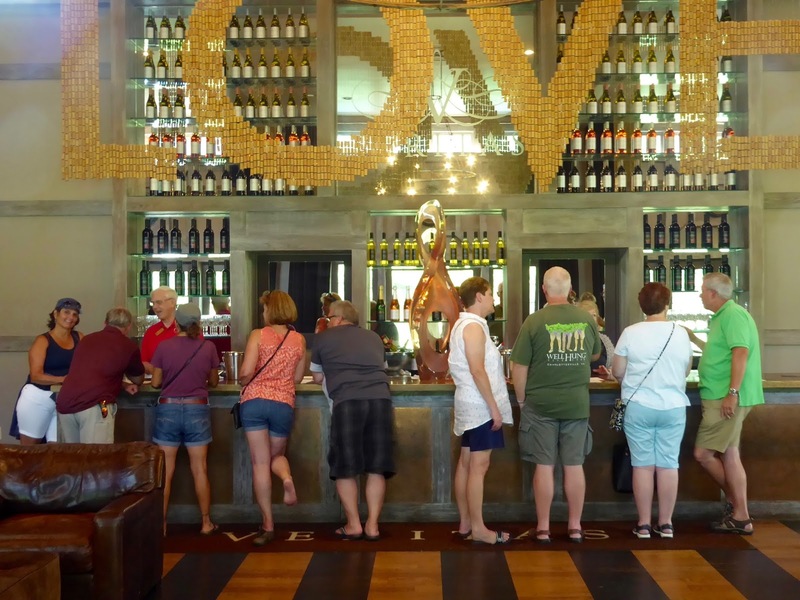 Judging from the groups there when we arrived and those who came in before we left, it is one of the more popular stops on the wine trail. 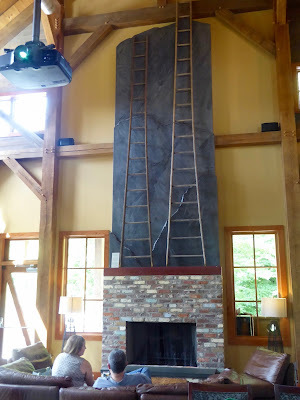 We might have lingered but spa treatments awaited us at Wintergreen. I selected the Signature massage, a bit of everything - Swedish, reflexology, hot stones (from local creek beds!) and a few techniques Amanda used I couldn't identify. Suffice to say it was the fastest 80 minutes ever enjoyed, although is any good spa treatment ever long enough? Not long enough was how I felt leaving Wintergreen. I wanted to return to the Copper Mine Bistro to try the boneless short ribs, a specialty they were out of the night we dined, and to sample a few more of their excellent wines. 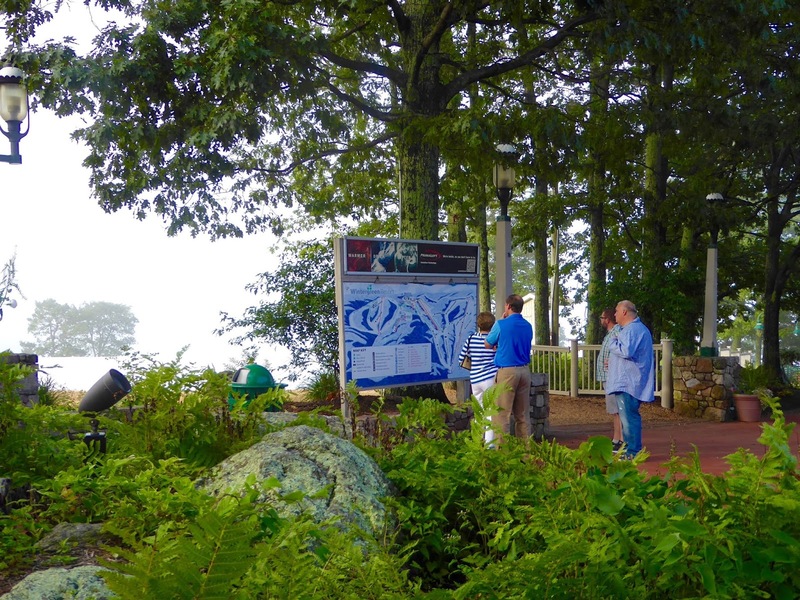 There had been no time for trying out a hiking path, diving into the aquatic center, stopping at more of the overviews or finding out where Muhammed Ali's property had been. Not to mention the air, clear, cool with tones of hay and fruit and evergreens. Need more deep breaths of it. Speaking of cool, consider this Wintergreen Fall deal. • Unlimited access to the Aquatics & Fitness Center. The offer is valid through Nov. 23, 2016 (restrictions apply; rates vary depending on dates of stay). Wintergreen Resort accommodations options include 230 villa-style condominiums and rental homes, from studio suites to nine-bedroom homes, each offering a fully equipped kitchen, and comfortable living area, and most come with fireplaces and a balcony, or deck. With Wintergreen as B&B hub, fall excursions to Thomas Jefferson’s Monticello and James Monroe’s Ash-Lawn Highland estates are within an hour’s drive and promise plenty of picturesque Virginia landscapes. 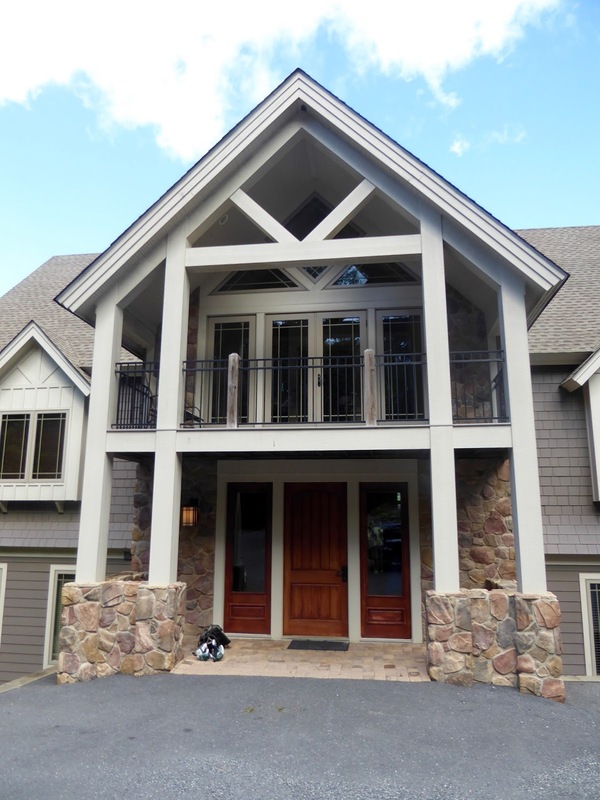 For more information call (888) 329-5828 or visit www.wintergreenresort.com. 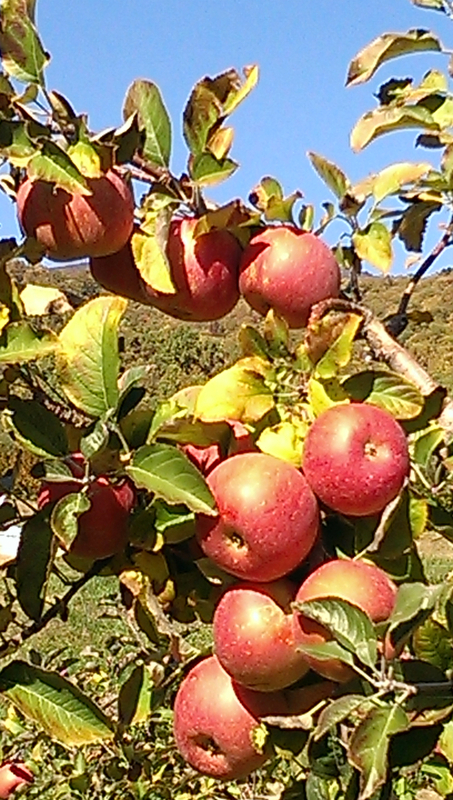 September - Jonagold, Empire, Golden and Red Delicious. 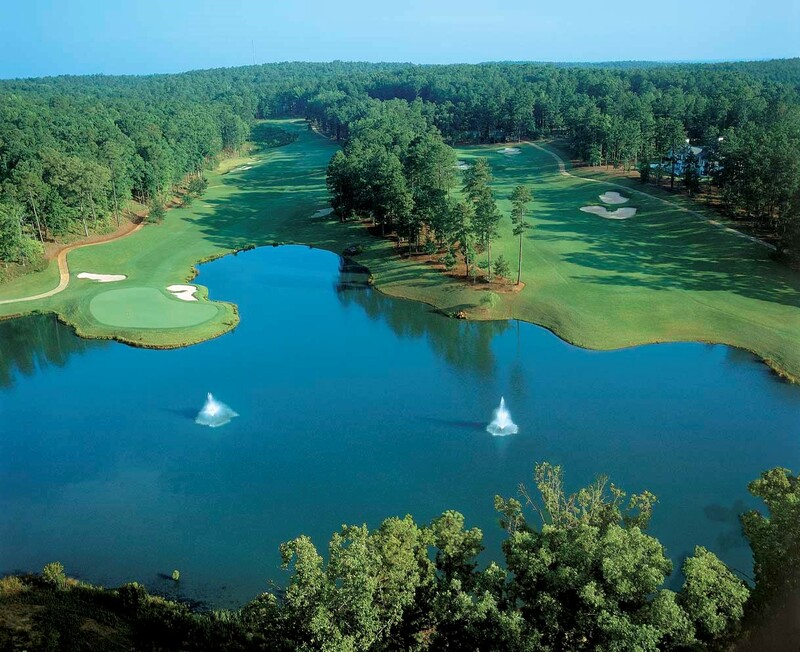 Of golf, that is, at Reynolds Plantation on Lake Oconee in Greeensboro, GA.
• Pricing from $249 per person, per night (minimum two people per cottage). With 19,000 acres and 374 miles of shoreline, Lake Oconee is Georgia's second largest lake, providing some of the state's best fishing, along with swimming, boating, water skiing, camping, picnicking, and water skiing. Other amenities include four full-service marinas and an award-winning tennis center. 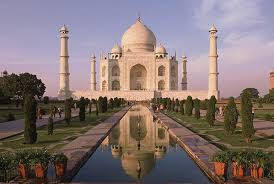 World Spree’s 12-day Incredible India tour starts as low as $1,399 in December and April, and that includes round-trip fare on Air China from San Francisco, Los Angeles and New York (Houston is $100 more), all transportation in India, 5-star hotels, daily international buffet breakfasts, six other meals, sightseeing tours, entrance fees, baggage handling and English-speaking tour guides. Non-stop flights on Air India are available from New York, Chicago and San Francisco for an additional fee. Those who fly Air China via Beijing can take advantage of China’s new 72-hour visa-free transit program and stopover in Beijing on the way home for 3 days/2 nights for only $200. There are also extensions to Amritsar (the Sikh Golden Temple) and Nepal. 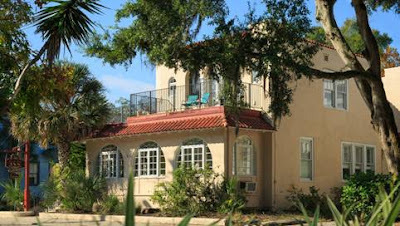 All prices are per person, double occupancy, and are subject to availability. There is no additional charge for credit cards. 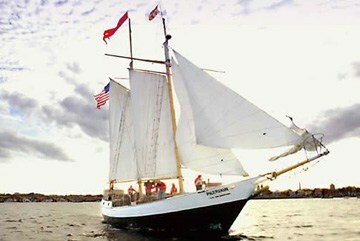 For additional information, visit www.worldspree.com or call toll-free 1-866-652-5656. Stay for two nights, Sunday through Thursday, at www.StFrancisInn.com or www.Casadesuenos.com now until September 29, 2016, and enjoy dinner and a cruise a no additional cost. Fine print: Offer must be mentioned at time of booking, based on double occupancy. Not available during holiday periods and may not be combined with other offers or discounts. 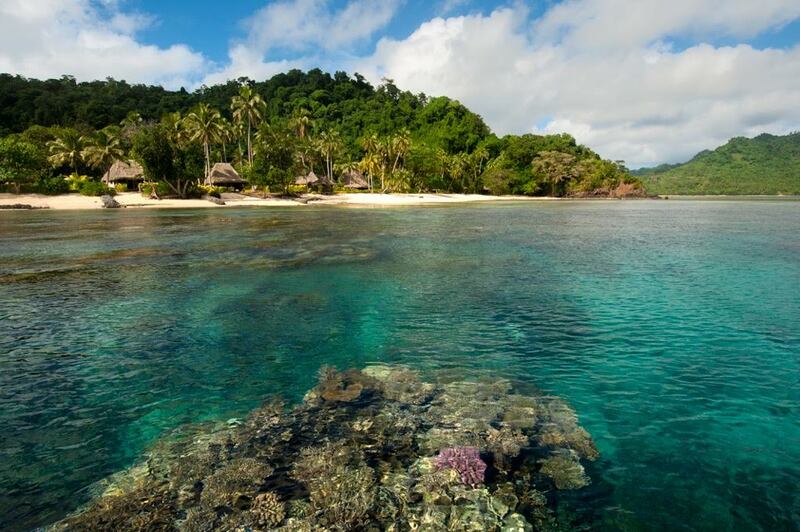 "Dive in Paradise" at 17-room Qamea Resort and Spa Fiji, named by CNN as one of the world's top luxury dive resorts. • Fijian cooking demonstration, village visit, Sunday church service, Lair (crab hunt), a Kava ceremony and meke (Fijian dancing and storytelling). Package price is $2,450 per person, space available, exclusive of taxes and based on twin share/double occupancy and is non-transferable, non-refundable. Must be booked by October 2016 for travel through March 31, 2017. Fiji can be reached by nightly 10-hour non-stop flights out of Los Angeles (LAX) to Nadi airport. Qamea Island is reached by an hour-log flight from Nadi to Taveuni followed by a short scenic private transfer for a 10-minute boat ride to the island and van to the resort. Spice up your life at the 9th annual Pepper Festival in Chapel Hill, NC, 2-7 p.m. October 2, 2016. 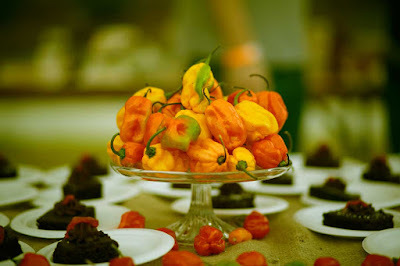 Celebrating fresh produce, Southern cuisine, bluegrass, craft beer and local peppers, the fest attracts 50 or so of the state's best chefs who create and dish up everything from pepper donuts to pepper beer.